We are engaged in manufacturing and exporting of a comprehensive range of Centrifuges like Centrifugal Oil Cleaner that are suitable to separate solid particles from fluid between 5 to 50 cst @ 1000 Celsius down to 0.3 microns. These are available in FT and CK range to meet the varied requirements of our clients. These are widely used for various engine and industrial fluid applications. 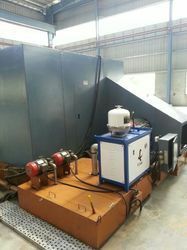 We supply Centrifugal Oil Cleaner (CK600) to our clients. CK600 centrifuge oil filter mainly used for the oil tank capacities from 400 liters to 1000 liters. It can separate the finest particles upto 1 micron from the oil. It is available with or without cut off valve (C.O.V) setting. Technical datasheet is attached for more information. Packaging Details: Air worthy packing with 5% extra cost which includes transit insurance. Looking for Centrifugal Oil Cleaner for Fastener Manufacturing ?